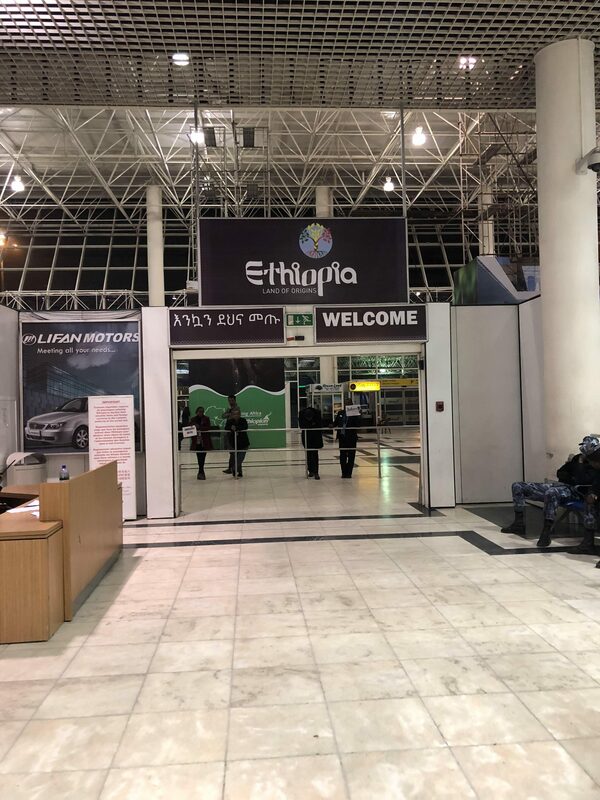 We were delighted to fly from Istanbul and to arrive at the airport in Addis Ababa. 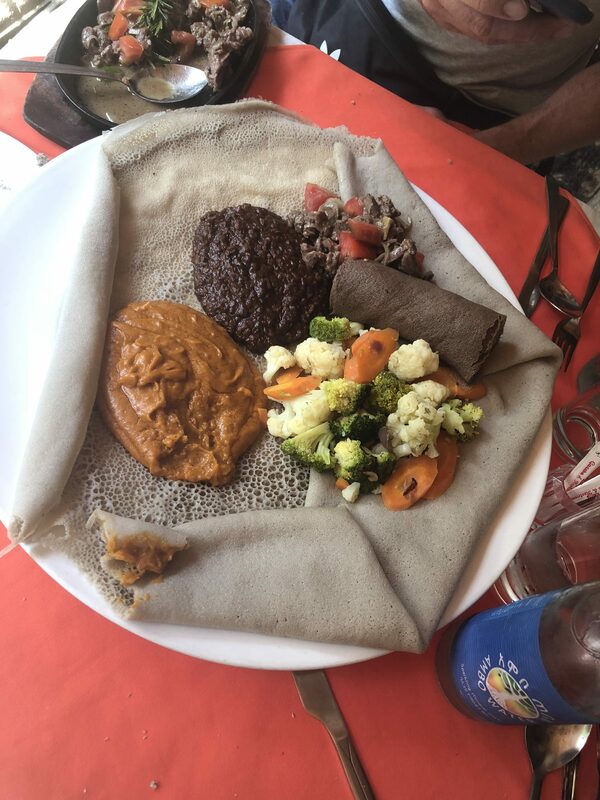 Ethiopia is truly the Land of Origins: of humanity, of language and of major parts of the Judeo-Christian tradition. 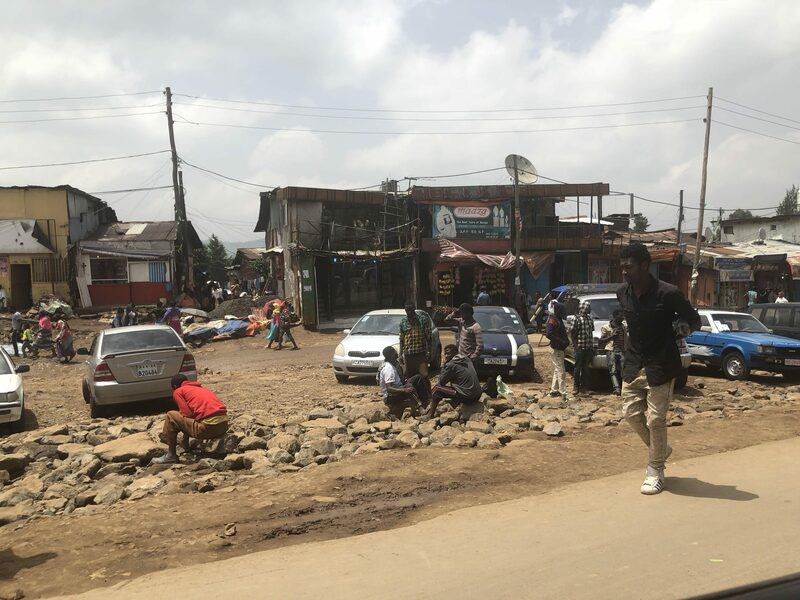 Historical note: Addis Ababa means ‘New Flower’ in Amharic and has been the political center of Ethiopia for only the past couple of hundred years out of a 3000-year history. 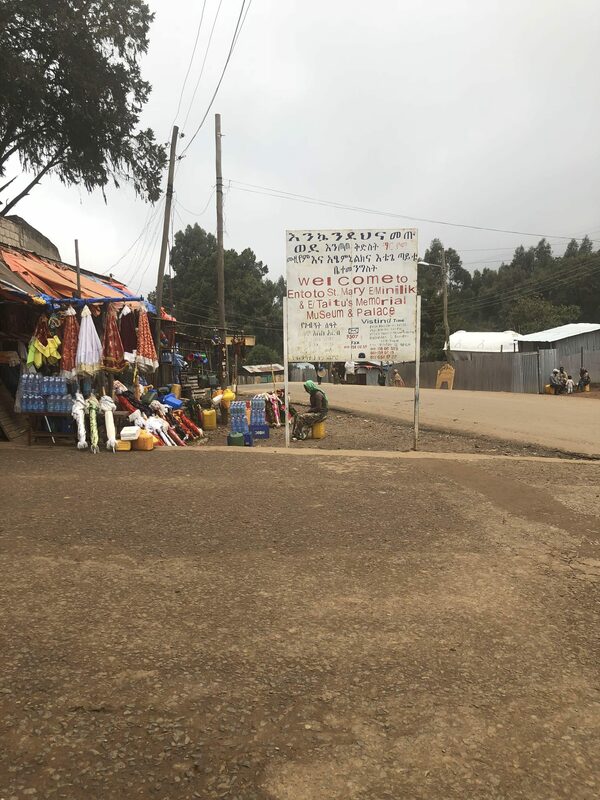 Linguistic note: The script on sign saying “Welcome” is Ge’ez. 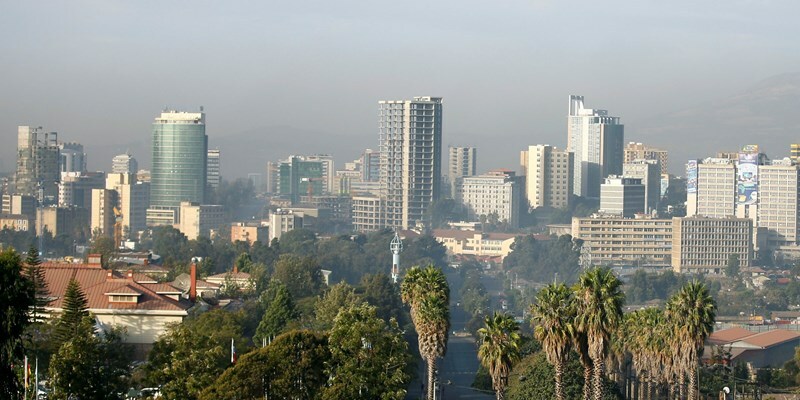 The working language of the country is Amharic, although people in Ethiopia speak up to 75 different language. 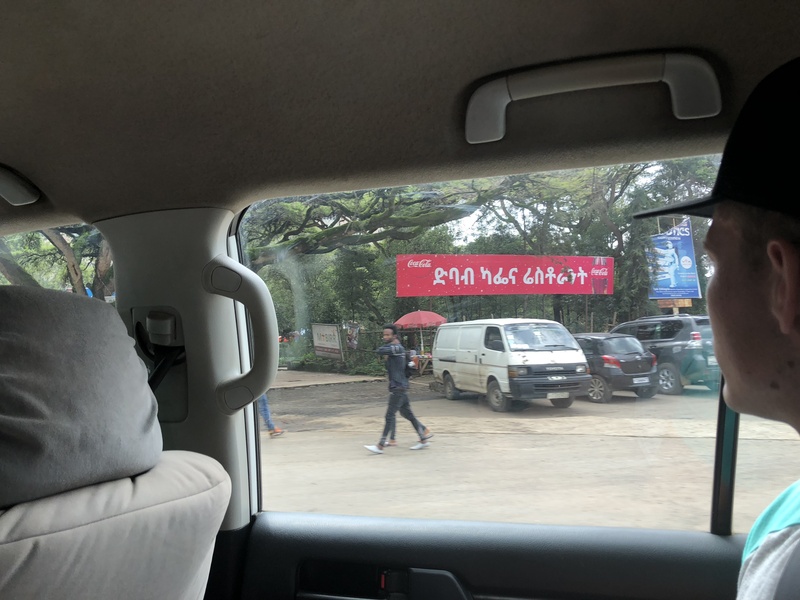 The lettering used to write the Latin-alphabet version of the word ‘Ethiopia’ on the welcome sign is a modified Sabian script. 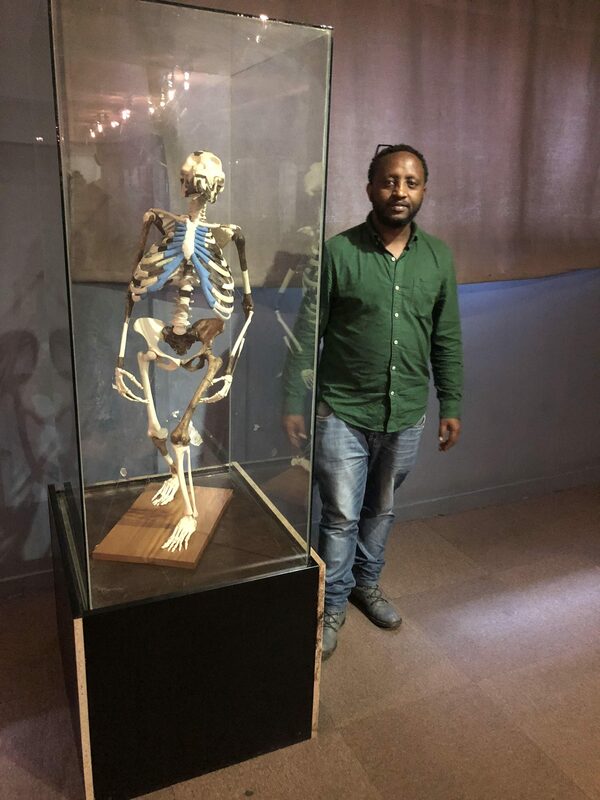 to see the skeleton of Lucy, the world’s most famous early human ancestor. 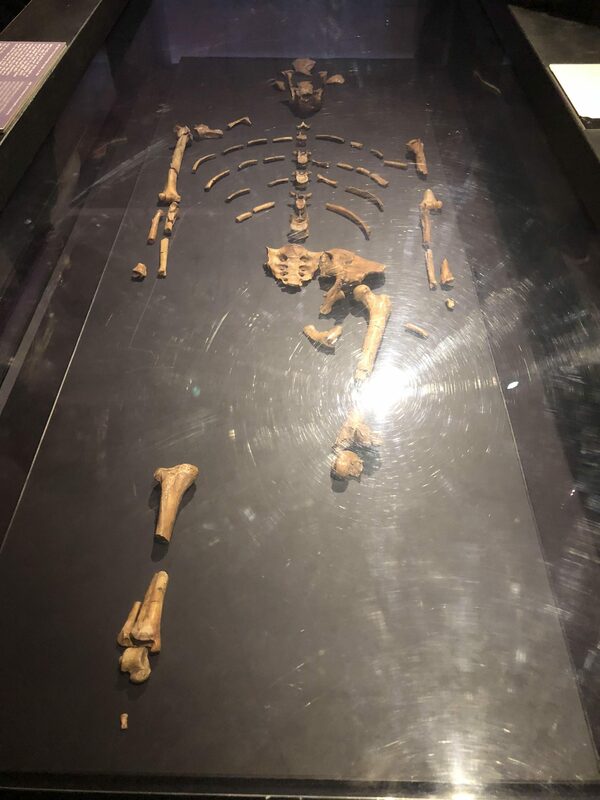 Her remains are 3.2 million years old, and she is important because she walked upright. 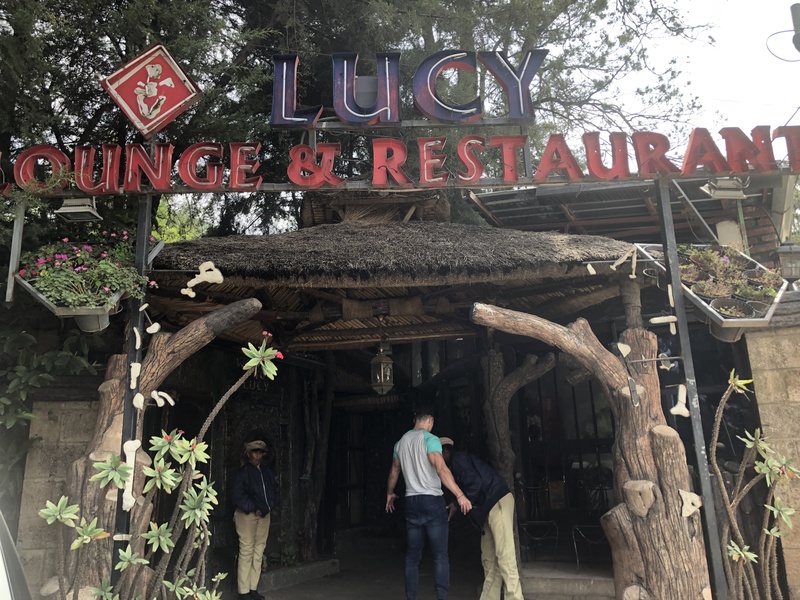 Lucy’s bones were unearthed in 1974 by a team of paleobiologists that included Maurice Taieb, Donald Johnson, Mary Leakey and Yves Coppens. She is so named because the song “Lucy in the Sky with Diamonds” was playing repeatedly at the archeological site. 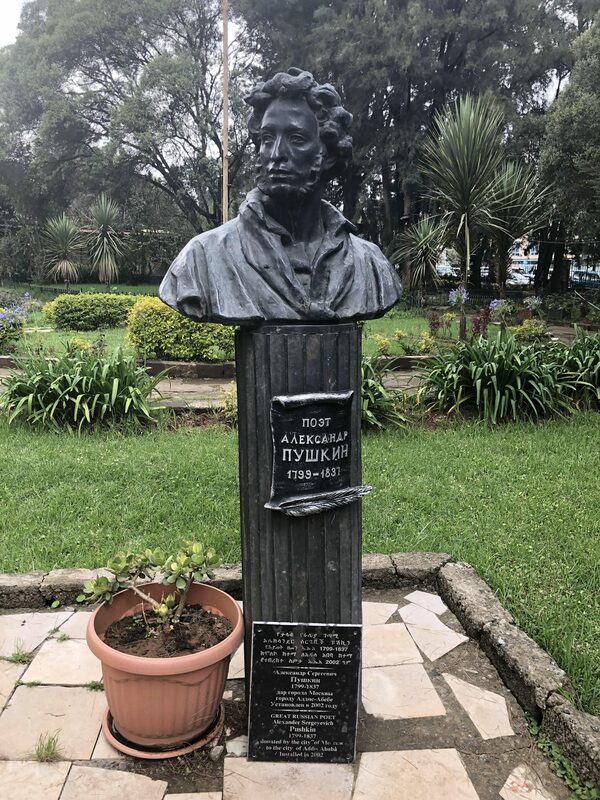 By the way, outside the museum is this statue of the great Russian poet Alexander Pushkin, in honor of his grandmother who was Ethiopian, thereby adding her to the list of famous Ethiopians. 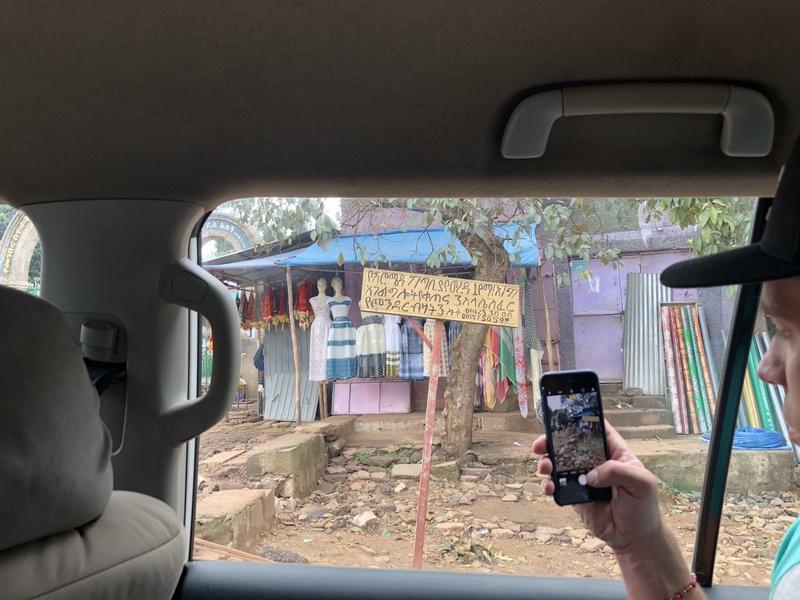 On this trip I became convinced that all roads lead to Ethiopia. 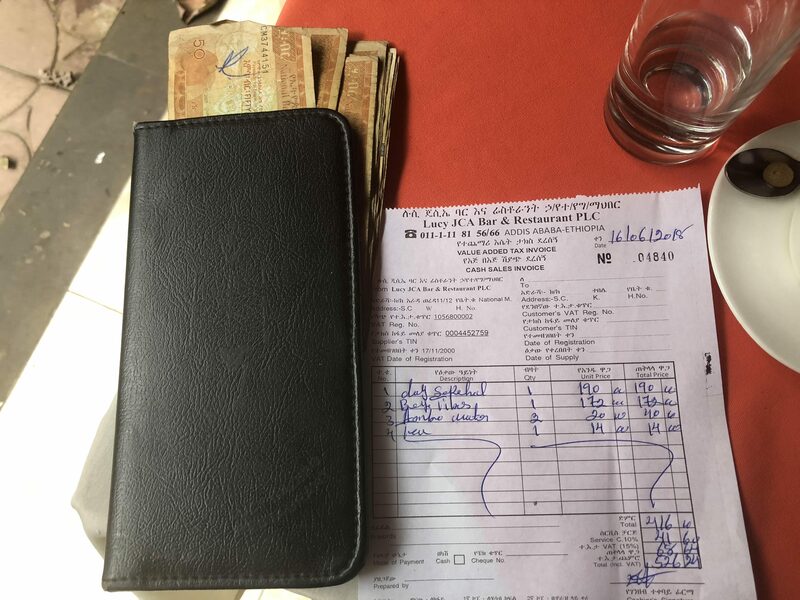 East Africa is birthplace of modern humans and, therefore, the birthplace of modern language. 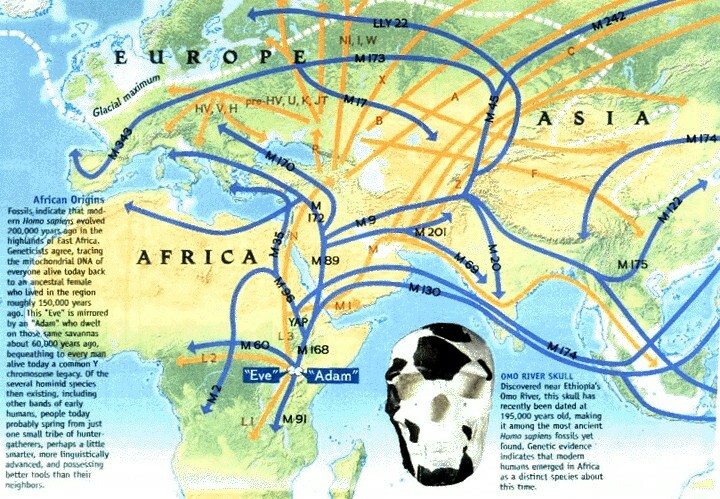 If I am reading this map correctly, the blue lines map out the paths of mitochondrial DNA (maternal lines from “Eve”) while the yellows lines trace the Y-chromosome groups (paternal lines from “Adam”) around the world. So-called Adam and Eve did not live at the same time nor were they ever the only two humans on the planet. Rather it is to their genetic material that all modern humans can be traced. 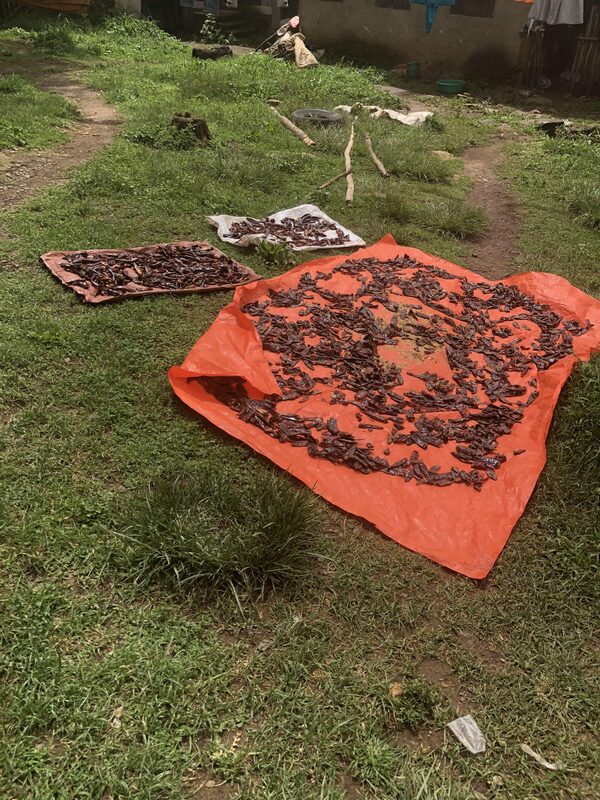 Linguists, myself included, think that language reached it modern state of complexity anywhere from 250,000 – 100,000 BCE, that is, before the major expansion of humans Out of Africa. 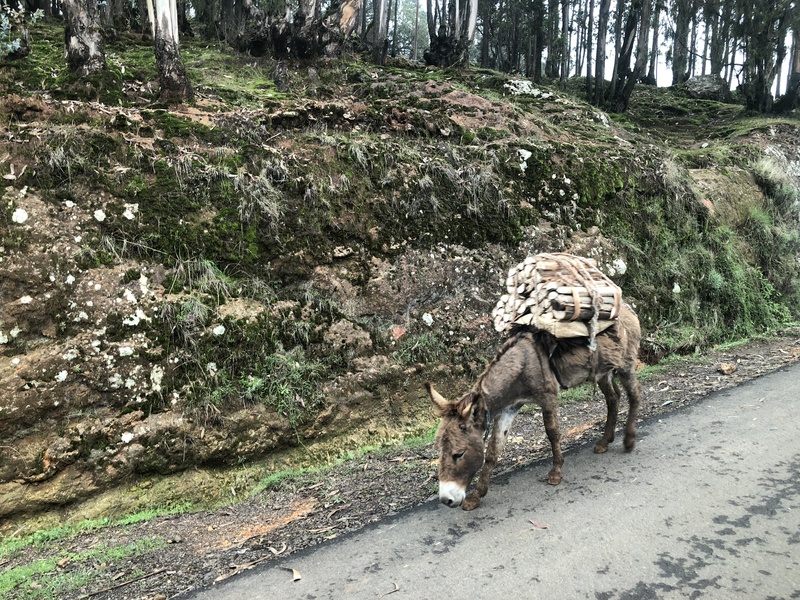 You encounter on the road everywhere goats, cattle and donkeys. 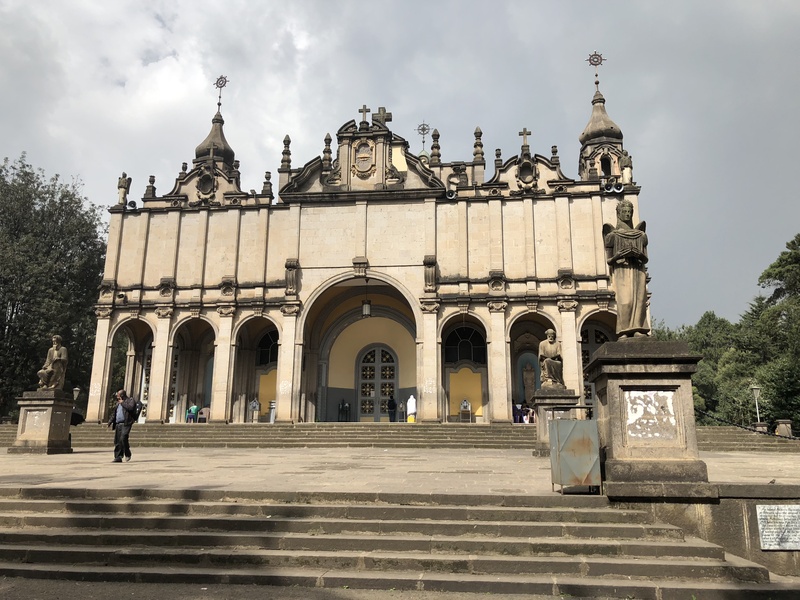 Christianity has been a part of Ethiopia since the 4th c AD. 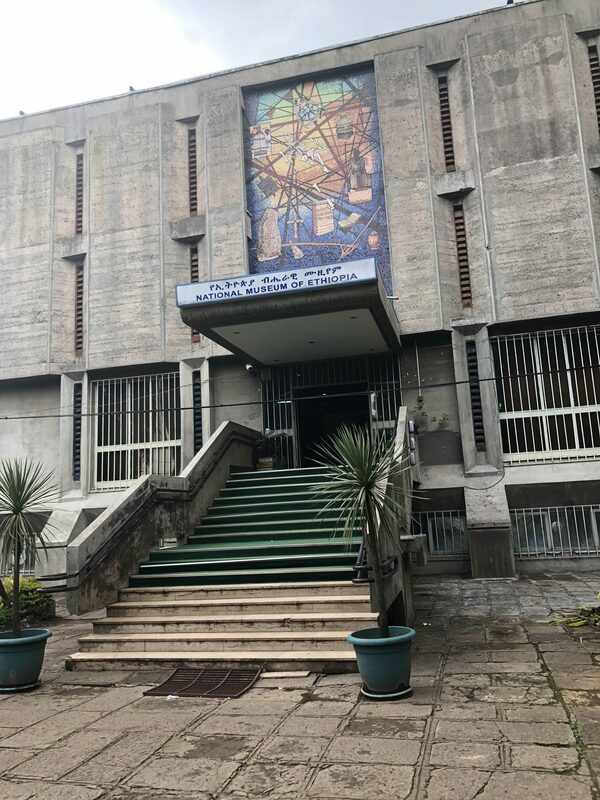 The founding church of Addis Ababa, St Mary’s, is on top of a hill overlooking the town. 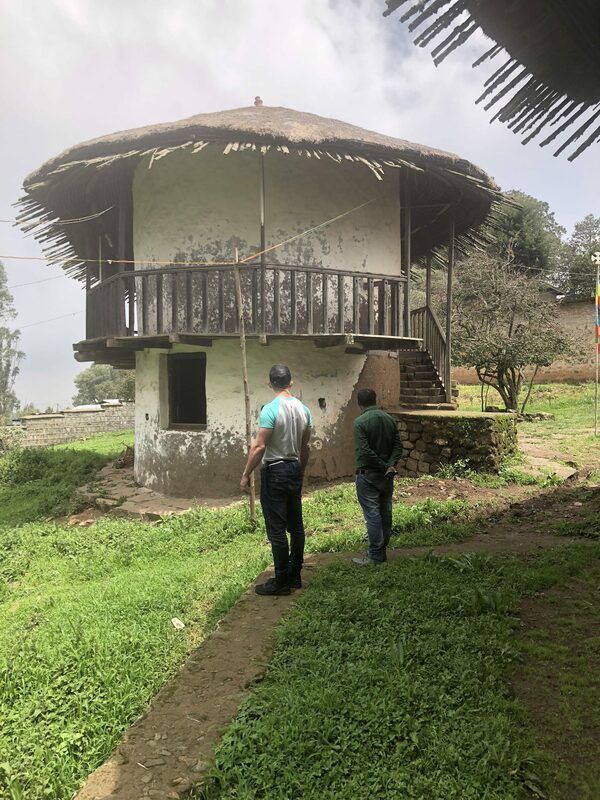 It’s a typical Ethiopian church, in that’s it’s round to symbolize unity. 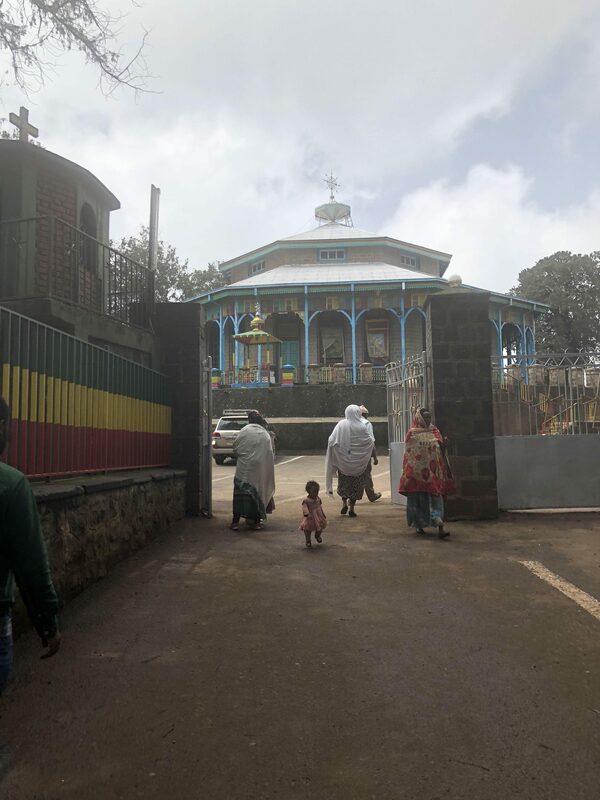 Churches have the three roofs, as you see here, and they are painted green, yellow and red to symbolize Ethiopia. Although you can’t see the colors on the roofs of St. Mary’s, you can see them on the fencing to the left. 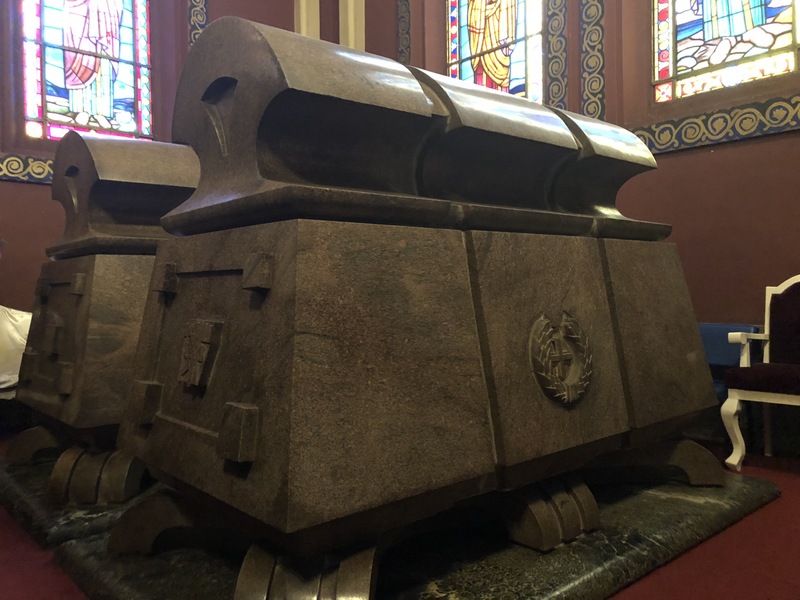 and saw the tomb of Haile Selassie. More on Haile Selassie and his towering importance in Ethiopian history in the next blog. Novels and Movies and Plays, Oh My!